Anne's Food: High time for pepparkakor! 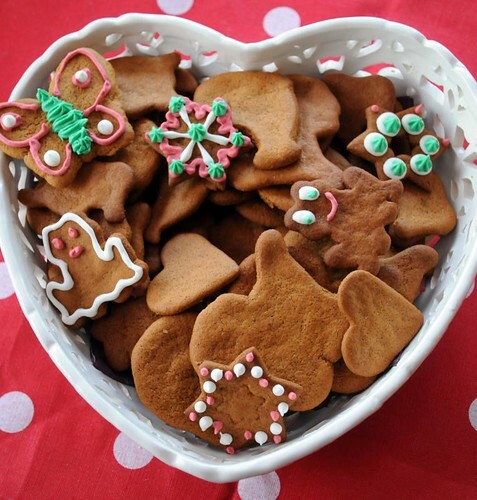 No Swedish christmas is complete without pepparkakor, our crisp gingerbread cookies. The name translates into "pepper cookies" which is actually not very correct, as they don't contain pepper and aren't spicy in a hot sort of way. They're very aromatic though, flavored with cinnamon, cardamom, cloves, ginger and sometimes a small amount of bitter orange peel. So happy to have found this blog... just what I am looking for! This December, I attempted Lussekatter (from another site) with great success! However, last April, my Swedish MIL found the ingredients here in the States impossible to make semla. So, I hope to try Dagmar's recipe next year... but, I suspect our flour was the culprit & is far too different here? Very excited to try so many wonderful recipes!